Many folks believe that helicopters didn't come into being until after World War 2 but that isn't true. Igor Sikorsky flew his first prototype in 1939, but Hanna Reich demonstrated helicopter flight in 1938 with the Fa 61 flown inside the Deutschlandhalle in Berlin (I've attended a concert in the Deutschlandhalle and the thought of that flight forty years earlier is still impressive). While a few types did serve during the war, their utility was still limited by technology of the day. When Larry Bell left Martin Aircraft to form his own aircraft company in the mid-1930s, he gathered a talented team which designed interesting aircraft from the P-39 Airacobra and America's first jet aircraft, the (less-than-successful) P-59 Airacomet to the first aircraft to break the sound barrier in 1947, the X-1. One of those engineers was Arthur Young who was developing his own concepts of rotary-wing flight and he led a special group to create the Model 30, Bell's first flying prototype using Young's designs. Depending on when you grew up, the iconic helicopter of my generation was the Bell 47. The signature bubble cockpit enclosure and erector-set tail boom is what many of us associate with a helicopter. Watching the early TV series 'Whirlybirds' as well as years later with the TV series MASH did we see the Bell 47 in action each week (never mind seeing them at any airfield every day). Ironically, most folks of the 'younger generations' think of the UH-1 Huey as that iconic helicopter not realizing that the Model 204 was derived from the earlier Model 47 turbine helicopter designs just as the AH-1 Cobra layout came from one of the early two-place attack helicopter designs based on a modified Bell 47 airframe. The authors have painstakingly assembled years of research to create this very informative title. 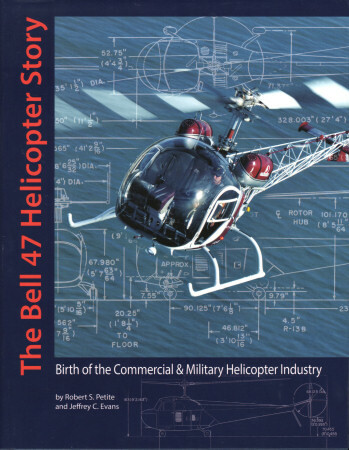 Much of the history of the Bell 47 had simply disappeared over the years, but by accessing a number of historical resources as well as folks involved with the development and operation of the aircraft, the authors were not only able to reconstruct an in-depth history, they were able to find hundreds of images that have never been published before. This is one of the most comprehensive research titles I've seen in print that captures a rare look into the commercial and military applications of this iconic aircraft while providing a good and entertaining read in doing so. If you're even remotely interested in rotary wing aviation and its history, this title is a must-have for your library. At present, it is available directly from the publisher (link below). My sincere thanks to Helicopter Heritage Canada for this review sample!